Tell me what's better, one Mae blouse or two? 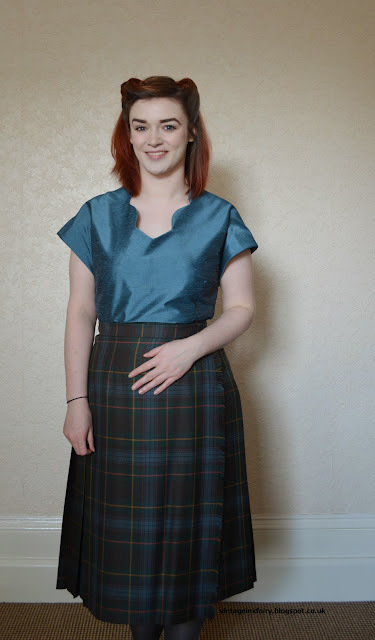 Emmie from her blog, My Oh Sew Vintage Life has sewn up two absolutely gorgeous Mae blouses that are to die for. This gal is a scalloped neckline rock star! 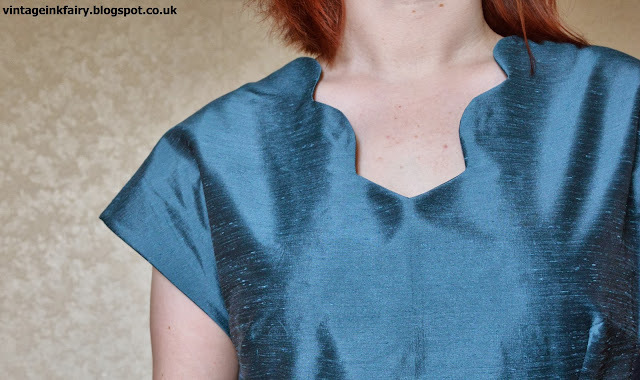 So seeing as Emmie is bordering on being a Mae blouse expert i thought it a good idea to pick her brain and find out what why she loves the Mae blouse enough to make TWO! My white blouse was a Linen-Look cotton from Minerva Crafts. I fell in love with the little lady head buttons first and chose the fabric to match! 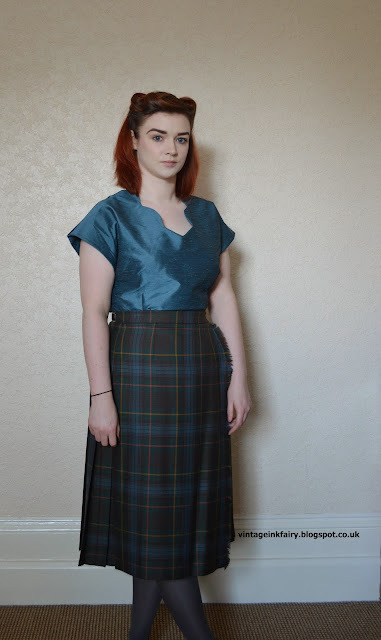 I was gifted the fabric for the green blouse, so am not 100% what it is but it looks like a stiff raw silk - whatever it is, I spilled red wine on it a few nights ago and it disappeared after a couple of minutes. It's magic fabric! I do try and keep a vintage style running through my wardrobe, so I wanted to keep the blouses nice and simple. I wanted to be able to pair them with as many items as possible, as I am overrun with skirts, and have very few tops! I am a bit of a button fiend, and love to be able to have a little surprise when I turn around! I did a few muslin's first, as I really wanted to get the blouse fitting well! I made an FBA after my first muslin, and let out the side seams a few times after my second! I over locked the insides and hand stitched down the facings (and the neckline of the white blouse). I've been impressed with how easy the scallops were to sew - especially using your tips. They look difficult, but they have come out nice and even every time. Also, I can get the blouse on with the first 3 buttons closed, so I can manage to do up the rest myself! I like the length of the blouse, too often blouses and tops can be drafted very short. 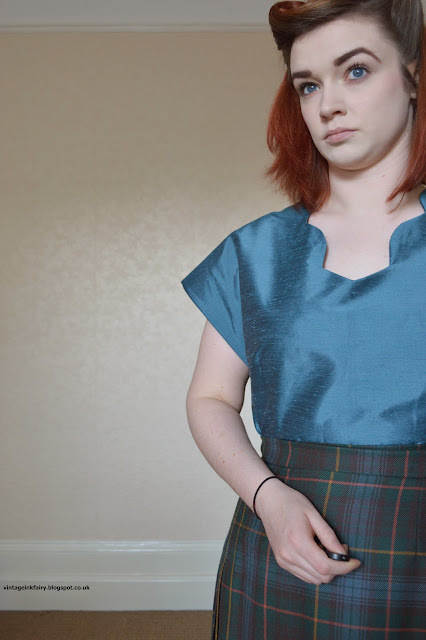 The blouse also sews up surprisingly quick - it's one of the only things I can start and finish in a day! *Are you planning any future Mae blouses? Yes, I have some cotton poplin put away for one in a beautiful Dusky Pink - maybe i'll be able to get to it after Christmas! 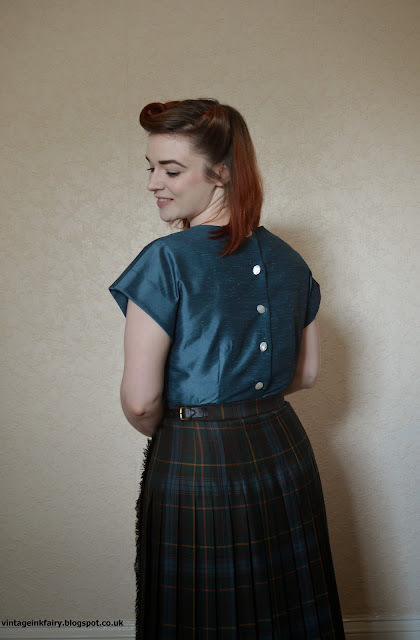 You can check out more on Emmie's blog My Oh Sew Vintage Life and read more about her two gorgeous Mae blouses.